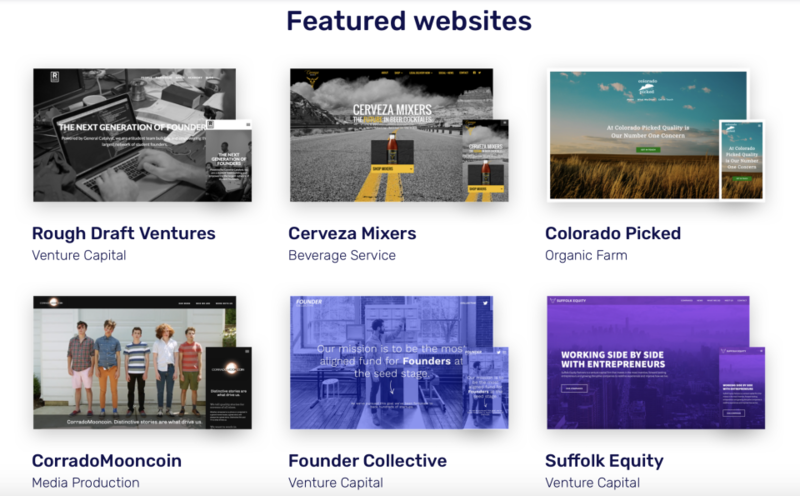 B12 makes custom websites accessible to small businesses. With our Do It For You (DIFY) approach, we create agency-quality websites at a fraction of the cost & time. First, our proprietary A.I. 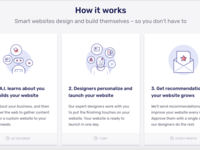 creates a rough draft of your website in 60 seconds, then our expert web designers incorporate your feedback to build & launch your site within days. Post-launch we offer custom, monthly recommendations on ways to improve your website, ensuring that your website improves as your business grows. Pros: My favorite is the Events and Testimonials page. The Testimonials page includes a form for customers to submit their own before/afters to us, while allowing us to add and maneuver those testimonials however we wish on the page WITH pictures! and full-size too, not just the thumbnail size. The movement of the carousel of quotes on the Home page is also a favorite feature. I feel these two pages is what really makes our website stand out. Cons: I feel there are options, but many are pre-made or behind-the-scenes options so if I don't like one of them, I have to ask for help or not do it at all. Overall: B12 was able to deliver a multi-page, interactive website that gave us a dramatic upgrade with low start-up cost. 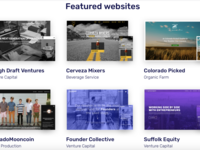 They were able to provide our new site with color, movement, and ways to connect with our customers through links, forms, & testimonials. The whole process was quick ( a couple weeks) and they worked with all the adjustments needed to get just the right balance of color, white space, and images. We had a couple extra hurdles in the transition, and Mac was great at keeping up communication with us throughout the whole process. We love our new site as we feel it gives a great first impression. We can't wait to keep adding to it! A DIY without the Y! Pros: B12 is amazing for getting a website up immediately. I mean in minutes! It uses smart AI technology plus they have actual people that will help you customize the design and to make changes. I've been using a dyi for 10 years. With B12 I enjoyed the ability to just 'set it and forget it'! Perfect for projects that you don't want to invest a lot of time with, or clients on a budget. You can still go back in and muck around with changes if you like. The best customer service anywhere! Seriously, look into this! Cons: I would like to make some changes more easily myself, a little more WYSIWYG, like add a pic her, resize a text field there, but it's not really their model. If I make too many changes to the style myself I end up with muck, so I needed an actual designer. Overall: I love to tweak my website but I overdo it. I needed a real designer. Now my site looks professionally designed yet personalized. Now I can feel confident promoting my business on my new site. Pros: B12 is what entrepreneurs of small business like me were waiting today. Machine learning + educated humans turns building a website into a big pleasure. I made an amazing website only in 1 day and got SEO included for a very small price. CSR from B12 is amazing! He helped me to overcome some difficult issues over the phone and additionally walked me through other 3d party services which are not included in B12 to improve my website functionality. Definitely would suggest this platform for everyone and will launch couple more websites soon. Thank you again B12 and thank you Dan! Pros: The ease of use, the suite is quite intuitive. There have been a few times where we needed help from B12, and they've been more than accommodating. The work they did initially with the layout, coding, and copyrighting for our new site allowed us to come in and tweak to our liking. Cons: The editing capabilities for photos would be great if there was a sizing chart so we had guidelines for image sizes. Overall: We had a very dated website with low information and visuals, it was more of a placeholder. With the effort and insight from B12, they were able to execute a new website for us that's especially pleasing and able to drive new business. It was great working with our account rep who was able to articulate what was working and what wasn't to the design team. Pros: The software is very easy to use. Although I'm not a web designer, I was able to go in and make changes to my website without assistance. Cons: The design was awesome, but I wish I could have had more input into what photos should go on my website. Overall: Overall, I would highly recommend B12 for those who are on a budget. I was a little worried at first because it took a few days longer than what I anticipated to receive the first draft of my website. However, when I heard back from them, I was satisfied. There were a few tweaks to be made, but they followed through and responded to my requests. *Very easy to work with. *Very quick to produce results. *Advanced user settings could be a little more streamlined / user friendly. Overall: My site is art centered. Most professional art websites are a clone of the 'white cube' aesthetic and one is not memorable from another. B12 gives me the opportunity to stand out from that crowd, and having actual people at B12 to interact with beats others 'email only' policy 100%. Pros: This has been one of the easiest switches I've ever made and also one of the best! Overall: showing up better in google, have had many compliments on the new site! This has been a great switch and helped business a great deal also!! Pros: The software is cutting-edge, easy to use and accommodating. I have nothing but great things to say. It has helped myself as well as my clients. Overall: My clients and affiliates are attracted to my website. They love the energy of the information. Pros: Fast, effective, flexible & responsive.. a leap forward for DIY sites, expensive web developers. Outstanding value. Cons: That I didn't find these guys sooner. I have been frustrated and had issues with other sites & programs as they either didn't understand what was needed, or they offered you a crude cookie cutter site or they simply dumped all the responsibility on you to cobble everything together. Overall: Outstanding service, responsiveness and flexibility. Creates great content quickly and is a great value. I highly recommend B12 to any business or organization that wants a great site & web presence. Pros: I like the look and feel of the product. Don't stop there too long, you'll regret it. Cons: From beginning to end this software is nothing but a buy button integration that try's to pass itself off as a real website. But if it walks like a duck? We all know that one. This is a poor mans excuse of a website, with a rich mans price tag. If you want to destroy your online reputation? This would be the way to go. Overall: It starts off great, everyone is very attentive, you feel welcome, warm, and cuddly, then they hardwire into your stuff and take you for all you got. Pros: It promised to be the next best thing to sliced bread with two hours of design consultancy for some dollars. At first blush the results were tantalizing. The offer of two hours of design assistance was great. Cons: They failed to follow through with agreed plans and missed important deadlines... taking my reputation with clients to task. Design assistance was non-existent and communication was by appointment only. Overall: I'm sorry. I didn't get benefits. I got headaches without refund. Pros: It seems cool, but it's Overkill for people who have some working knowledge of web design. Cons: I can't speak much to the service. It seemed cool, but I quickly realized that it wasn't really necessary for me. I asked for a refund less than 24 hours after purchase. Representatives from the company responded saying I could have my money back, but hounded me to have a demonstration first. I declined and asked for a refund again. This was a few weeks ago. I have emailed several times with no response and no refund. I'm very disappointed and can't recommend B12. This is dreadful customer service. Overall: I am never going to understand the business practice of ignoring a customer asking for a refund. I understand that it's disappointing to lose a sale, but holding my money hostage is not the way to retain business. They sell their service . I was charged.A month alter, still no website! Pros: None. 4 revisions to my design and my requests were completely ignored. At one point, they said my website was ready when they did nothing to it. Cons: Dishonest. After a month of trying to get a decent website I cancelled my account. They refuse to refund the money despite not building a website or having it go live. Pros: The team at b12 has been super helpful in launching our brand new website and helping us attract more leads. Also it loads a lot faster and looks so clean. Cons: Sometimes there are certain restrictions within the template that are very difficult to figure out. But the team helps customize it as best they can. The B12 Platform was very easy to learn. It is very cost effective. The customer support is Great! Pros: Very easy learning curve. It actually sets up most of the copy on the new website in seconds! The support was great because I got to talk to a live person and not just a chat or email. Overall: Got my website up in hours! Very easy to learn and implement. Customer service is fantastic. i would highly recommend B12. Excellent does not even come close to how great this company is. Pros: They do most of the work for you. Filling in most of the important information and details of your business. Cons: There is a bit of a learning curve, but their customer service dept is always available to help. There is always a quick response. Pros: I could easily add things and remove them on my own. Cons: The initial figuring it out was a bit tedious but once figured out, it was good. Overall: It all went well and smoothly! My questions and concerns were addressed promptly as well. Thanks so much! Terrible idea and not engaging. Worse than directory listing services. Pros: No pros. I went through 3 revisions and the b12 staff never implemented what I asked of them. Not only that, but the design was absolutely horrible. Cons: Horrible product. Horrible website generated. Customer service / their staff that provides revisions dismissed my input. Most people would have steered clear of this at the outset. It promises a lot, and delivers none. Overall: No benefits, all negatives. It is a terrible product that capitalizes on people's need for a new site but without a budget and I like to DIY so I figured I'd give this a shot to my dismay. Pros: The ease of use! I never thought I'd be able to design my own website but with B12, it was like cake! Overall: It took a little bit of getting used to, but that was mainly my impatience in the way. 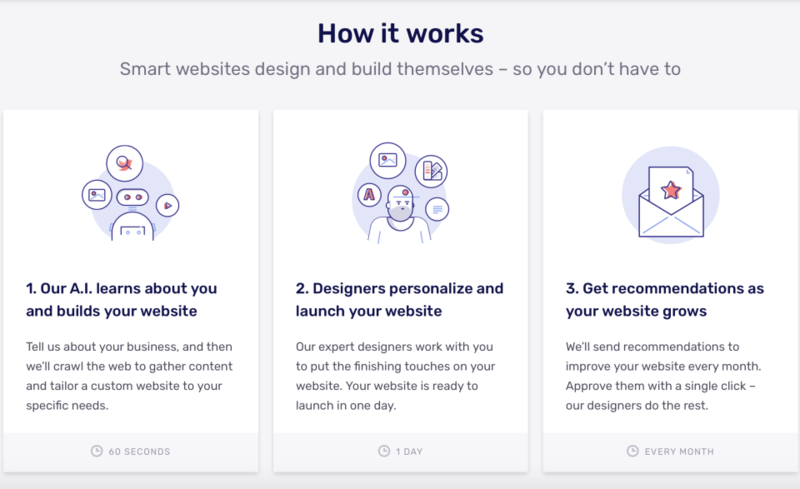 Pros: The onboarding process is super simple, you answer a bunch of questions surrounding what time of website you want and the software creates a website for you. Cons: After you have a website there is virtually no ability to customize the website further. You can change text and that's about it. We are really sorry to hear about your experience with B12. It's our goal to meet and exceed the vision you have for your website. Please kindly reach out to us at hello@b12.io or via chat. We would love a chance to make this right! Thank you. Quick launch of a professional website which saves time and money! Pros: Great value for small businesses that don't want to spend all their time working on their website. The team members are bright and helpful. Intelligent customer service. Cons: There's no blog or article posting function. Would like to have a way to create content more easily. Everything went off without a hitch. Fast, Friendly service! Pros: Customer Service is top notch. The design team listens to what you're looking to do and has not problem executing. Cons: Sometimes, it's difficult to actually speak with a team member. Often times, it's easier to relay your wishes voice to voice versus via email.